Summer is officially here, and the temperature has soared over the last few weeks (sorry to anyone shivering in the Northern Hemisphere). All through winter I was wondering if we’d have enough cupboard space to store a 25 tog arctic duvet during the day (answer: not a chance), and suddenly it’s a question of how we’ll be able to cool the van down, particularly at night. 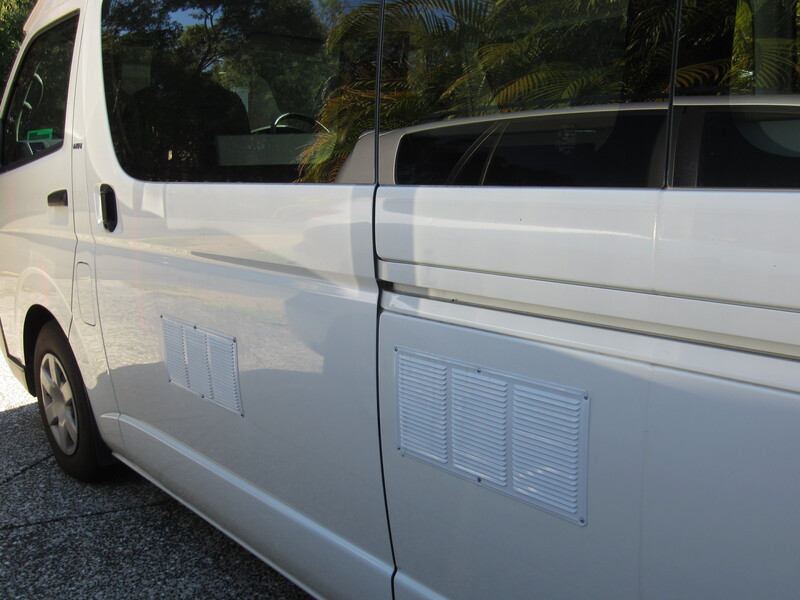 Draw an outline of your vent panel on the inside and outside of the van. On the outside of the van, cut three 10cm diameter holes through the body work with a hole saw, and seal them with a rust proofer. 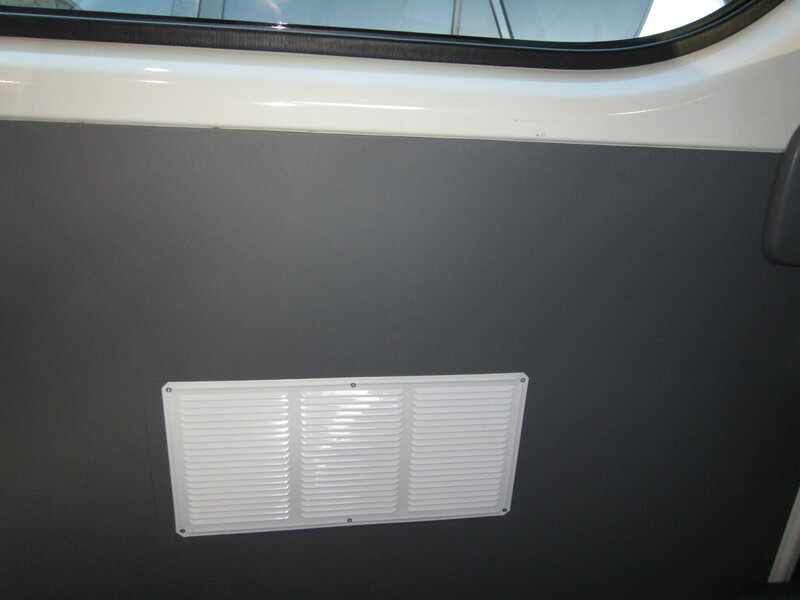 Note – if you’re fitting a vent to a door like we were, you’ll find it has extra bracing and reinforcements than the rest of the van – be careful to avoid these when you’re drilling. Drill 6 bolt holes around your outline on the outside and rust proof each one. 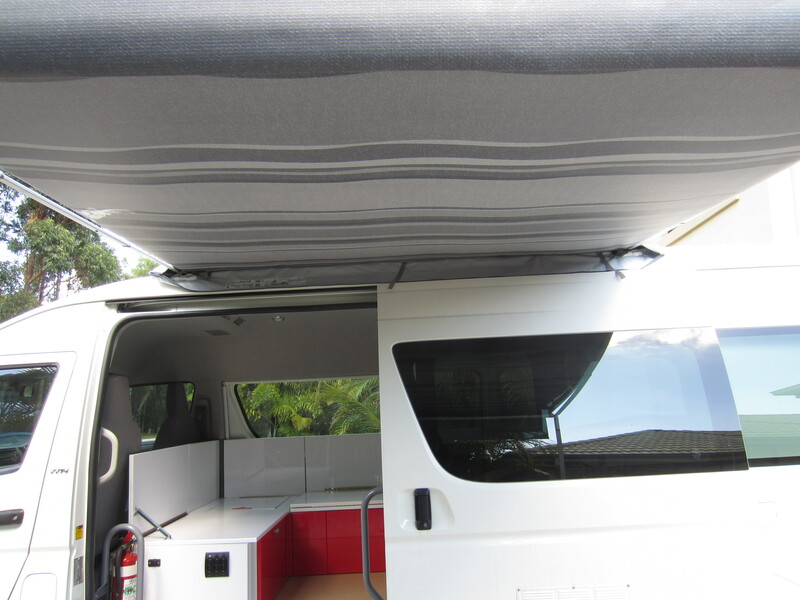 Squeeze a line of silicon around the inside edge of the vent panel intended for the outside of the van (to prevent water seepage). Attach this vent panel to the outside and bolt through. On the inside of the van (ours is hard board) cut a square hole a few centimetres smaller than the outline you’ve drawn, and tighten the bolts you’ve just screwed through with nuts. Take care not to screw them too tightly, as the outside body work will start to bend inwards. Fit the inside panel over the template you drew and simply screw 6 bolts into the hard board. Paul boxed in the top using the same gloss wood he’s used all the way through. 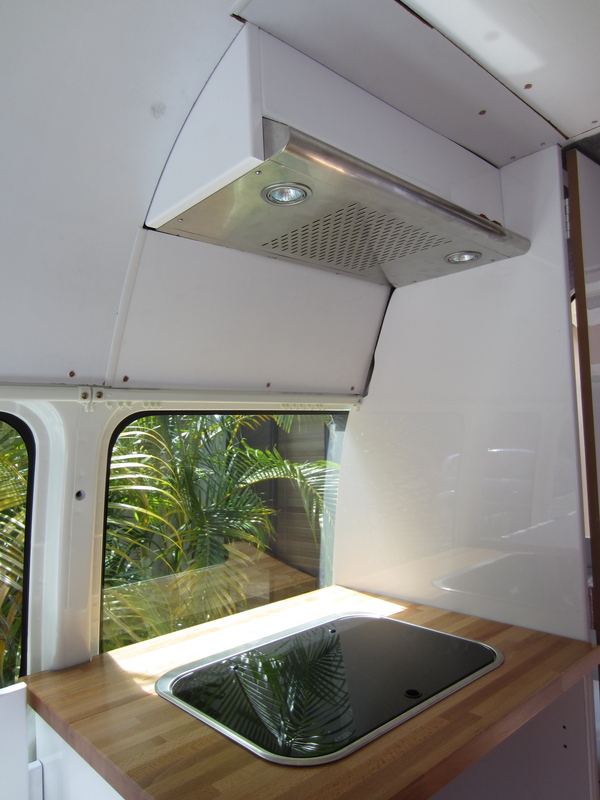 So that’s the campervan’s ventilation, but hopefully for most of the time we’ll be sitting outside under our lovely new awning! For some reason awnings are incredibly expensive. 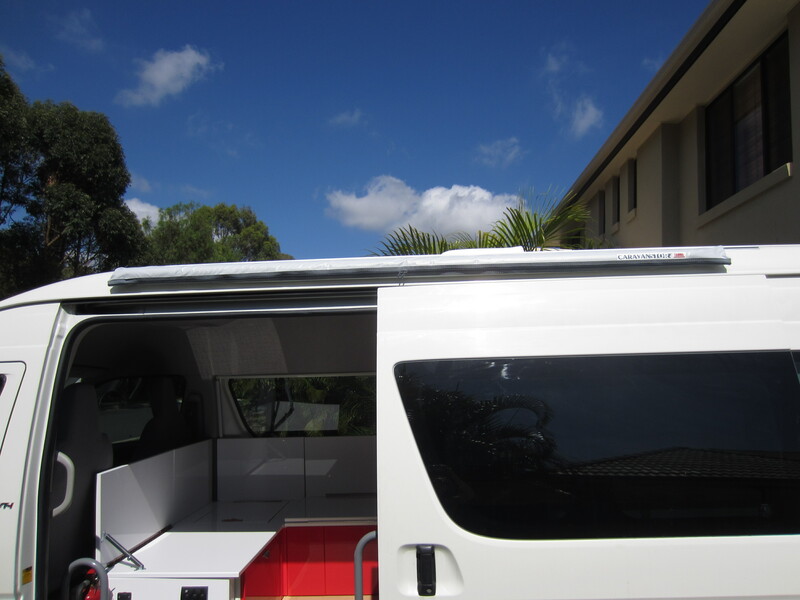 This one is a Fiamma ‘bag awning’ from Caravans Plus and a really basic version, but it was still one of our most expensive campervan purchases. You have to roll it down manually, but it seems to work okay. 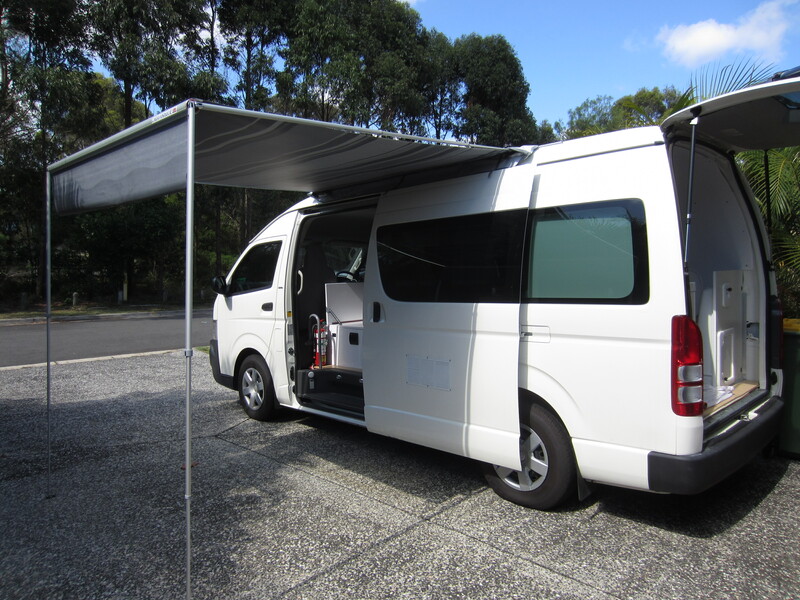 The frame is fixed to the van and you roll the awning in and out of its bag. You can then remove the cover and store the whole thing inside when you’re not using it. So there’s not much left to do now: refit the ceiling, build a bathroom door, fit the door handles and then we’re almost there! Oh, and make 11 curtains. 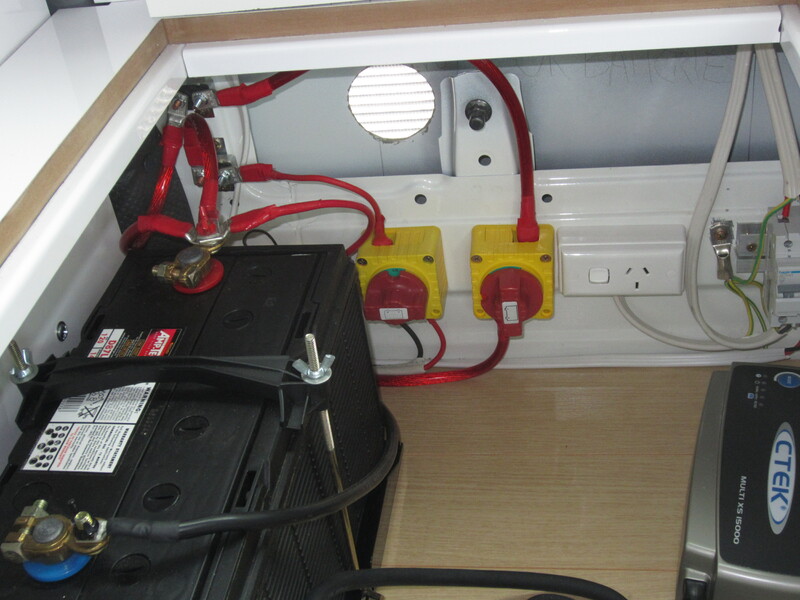 This entry was posted in Building a diy campervan, Camper ventilation and tagged build a campervan, campervan air conditioning, campervan air vent, campervan awning, campervan ceiling fan, Campervan conversion project, campervan kitchen, Campervan photos, caravan awning, Caravans Plus, convert a campervan, Converting a campervan step-by-step, DIY campervan, fitting a vent by Rach. Bookmark the permalink. Well done you two – its really coming together now!!! Can’t wait to see the final product! 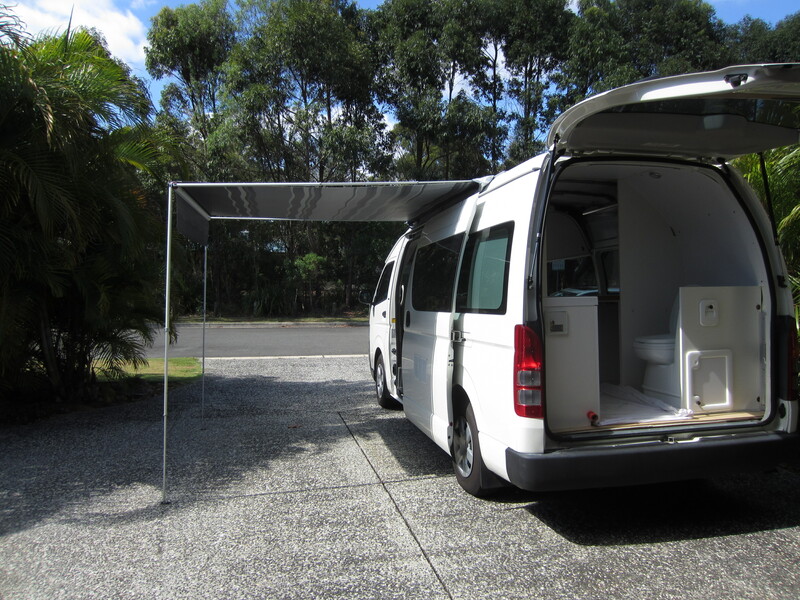 An interesting thought – if you reverse up to the beach – you can sit on the loo and have a wonderful view……………..as well as read the paper!!!! That is an interesting thought! !